Enhanced grip boards, which are manufactured with a strip or strips of non-slip resin material on the surface, are used to provide protection for end users in high risk areas. So-called ‘slip-sensitive areas’ such as ramps and steps – as well as public access walkways – present a greater risk to end users, especially when wet, increasing the risk of a trip or fall, which could result in costly legal action. 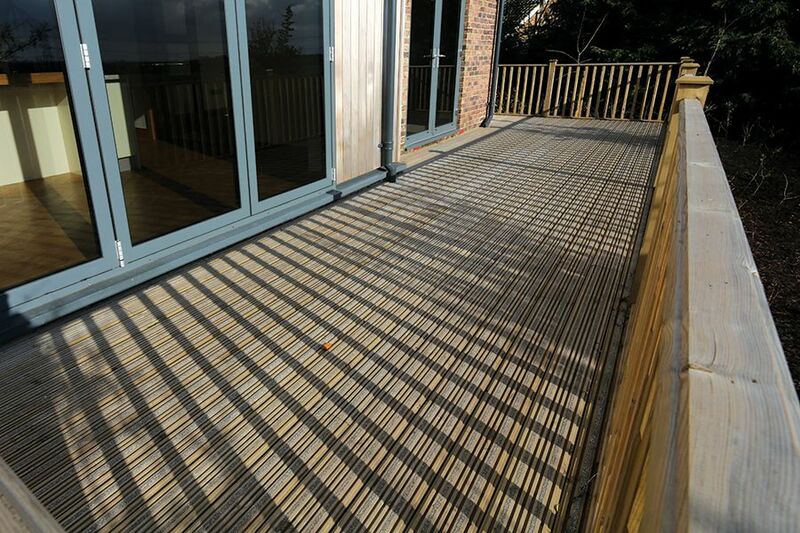 High footfall over a period of time can also degrade standard decking causing it to become slippery. By opting to install enhanced grip boards in ‘slip-sensitive’ and high traffic areas, risk will be minimised and the decking will remain as safe as possible for end users. While installing railings can also help minimise the risk of falling – particularly on ramps and steps – enhanced grip boards go a step further, protecting those carrying objects such as trays of drinks or food across the middle of an area of decking. Available in softwood, as well as on both smooth or grooved boards, using enhanced grip boards, which can also be stained or painted, means there is no need to comprise on aesthetics. For those looking for a composite decking solution, Trex Contour decking boards feature inherent enhanced grip properties which meet the UK requirement for low-slip potential. The boards can also provide a flexible solution as either all or part of a deck can be installed using such boards with retrofitting options also available in some cases. For added peace of mind when specifying for the commercial market look for the DeckMark™ Plus mark, which identifies enhanced grip boards which have been independently tested for slip resistance to British Standards. Arbordeck’s enhanced grip boards have all been tested under both wet and dry conditions and far exceed the threshold set for slip potential. To find out more about our range of enhanced grip boards please visit our low-slip decking page.